Got the munchies?? 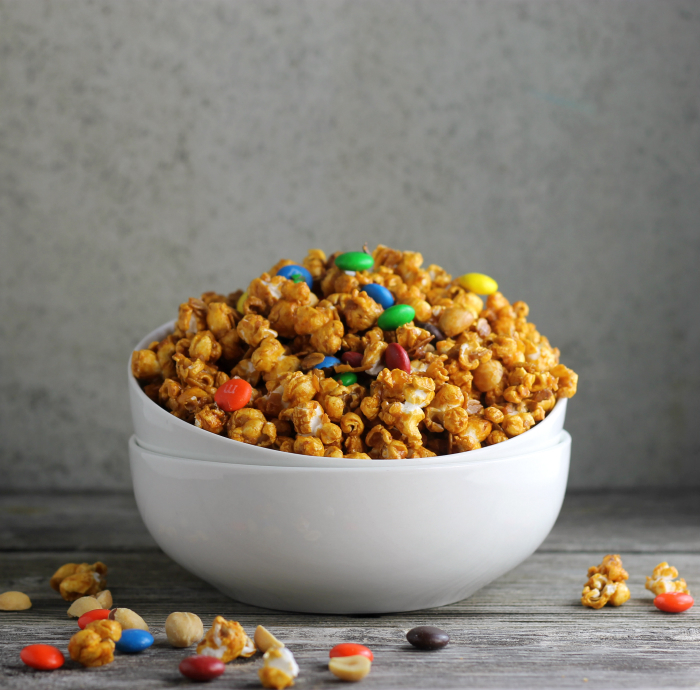 Try some of this caramel popcorn trail mix. Are you thinking what the heck caramel popcorn trail mix is? I know it is sort of a weird title for this sweet munchy snack, but this is not just your everyday caramel popcorn. 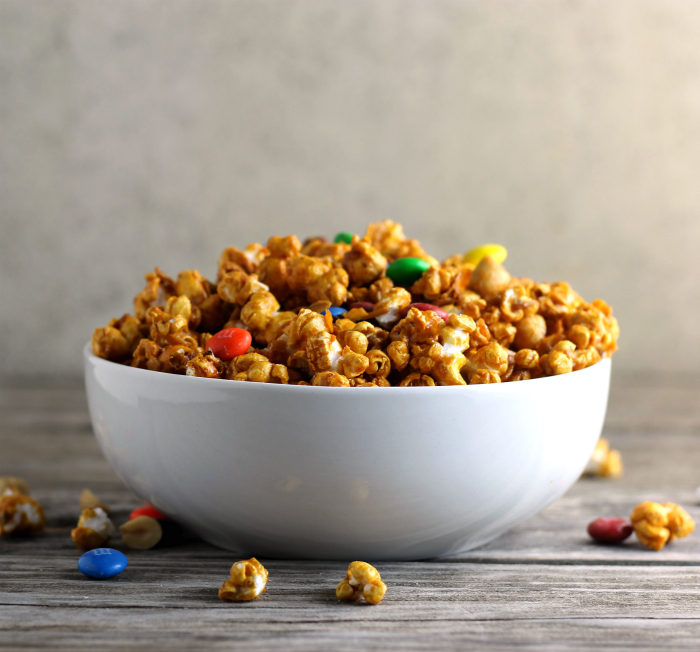 When you are eating this snack you will see that there is more to this popcorn that just caramel and the popcorn there are oats, flakes of coconut, peanuts, and M&Ms. Some of the yummy stuff that I like in my trail mix. We are a family that likes to play games. So what does this have to do with caramel popcorn trail mix?!? Well, you see when we are playing our games we need something to snack on. Popcorn is the snack of choice when there is cards, dice, or whatever the game of the day is. But, today I am dressing things up a bit, using a recipe that is similar to what my mom used when I was a kid. She used hulless popcorn for her recipe and I am replacing some of the sugar with honey. Although there is not as much sugar in the caramel sauce, there is still a yummy sweetness to this treat. As we were getting ready to play cards actually this evening, I set the caramel popcorn trail mix out for everyone to sample and everyone was munching on it, I thought it would be gone before the game ever started. 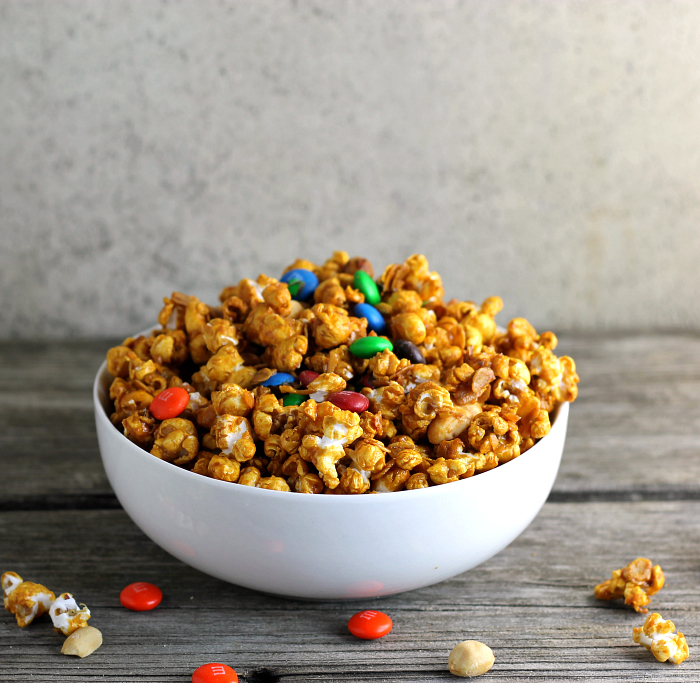 When you have the munchies I hope that you will think of this caramel popcorn trail mix and make a batch. In a large baking dish add the popped popcorn, oats, sweetened coconut, and peanuts mix well and set aside. In a large saucepan mix together the butter, honey, brown sugar, and salt. Cook over medium heat for 2 minutes remove from heat and stir in the baking soda. (If you like a crunchier popcorn cook the sauce an extra 30 seconds or more). Pour the mixture over the popcorn mixture and mix until everything is evenly coated. Place the popcorn into the preheated oven and bake for 45 minutes, stirring every 10 to 15 minutes. Remove from the oven and stir in the M&Ms. Cool completely. Store in an airtight container. I love, love caramel corn and having this trail mix around could be very dangerous!!! Great recipe! 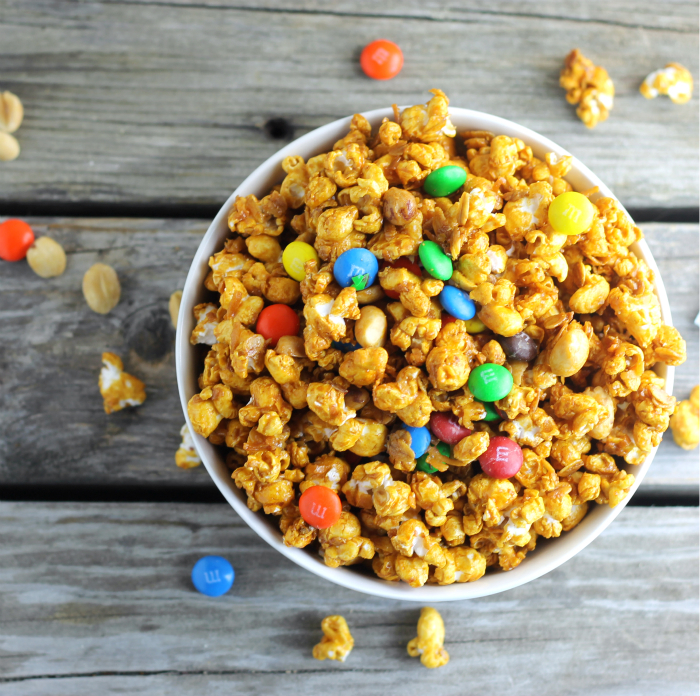 This popcorn trail mix must be incredibly addictive! When it comes to caramel popcorn I just can’t stop eating it! Looks so delicious!